1. Lower your expectations. The happiest authors are the ones that don’t expect much. 2. The best time to start promoting your book is three years before it comes out.Three years to build a reputation, build a permission asset, build a blog, build a following, build credibility, and build the connections you’ll need later. 3. Pay for an editor. Not just to fix the typos, but to actually make your ramblings into something that people will choose to read. I found someone I like working with at the EFA. One of the things traditional publishers used to do is provide really insightful, even brilliant editors (people like Fred Hills and Megan Casey), but alas, that doesn’t happen very often. And hiring your own editor means you’ll value the process more. 4. Understand that a non-fiction book is a souvenir, just a vessel for the ideas themselves. You don’t want the ideas to get stuck in the book… you want them to spread. Which means that you shouldn’t hoard the idea! The more you give away, the better you will do. 5. Don’t try to sell your book to everyone. First, consider this: 58% of the US adult population never reads another book after high school. Then, consider the fact that among people even willing to buy a book, yours is just a tiny little needle in a very big haystack. Far better to obsess about a little subset of the market – that subset that you have permission to talk with, that subset where you have credibility, and most important, that subset where people just can’t live without your book. 6. Resist with all your might the temptation to hire a publicist to get you on Oprah. First, you won’t get on Oprah (if you do, drop me a note and I’ll mention you as the exception). Second, it’s expensive. You’re way better off spending the time and money to do #5 instead, going after the little micromarkets. There are some very talented publicists out there, but in general, see #1. 7. Think really hard before you spend a year trying to please one person in New York to get your book published by a real publisher. You give up a lot of time. You give up a lot of the upside. You give up control over what your book reads like and feels like and how it’s promoted. Of course, a contract from Knopf and a seat on Jon Stewart’s couch are great things, but so is being the Queen of England. That doesn’t mean it’s going to happen to you. Far more likely is that you discover how to efficiently publish (either electronically or using POD or a small run press) a brilliant book that spreads like wildfire among a select group of people. 8. Your cover matters. Way more than you think. If it didn’t, you wouldn’t need a book… you could just email people the text. 9. If you have a real publisher, it’s worth investing in a few things to help them do a better job for you. Like pre-editing the book before you submit it. Like putting the right to work on the cover with them in the contract. And, most of all, getting the ability to buy hundreds of books at cost that you can use as samples and promotional pieces. 10. In case you skipped it, please check #2 again. That’s the most important one, by far. 11. Blurbs are overrated, imho. 12. Blog mentions, on the other hand, matter a lot. 13. If you’ve got the patience, bookstore signings and talking to book clubs by phone are the two lowest-paid but most guaranteed to work methods you have for promoting a really really good book. If you do it 200 times a year, it will pay. 14. Consider the free PDF alternative. Some have gotten millions of downloads. No hassles, no time wasted, no trying to make a living on it. All the joy, in other words, without debating whether you should quit your day job (you shouldn’t!). 15. If you want to reach people who don’t normally buy books, show up in places where people who don’t usually buy books are. Media places, virtual places and real places too. 16. Most books that sell by the truckload sell by the caseload. In other words, sell to organizations that buy on behalf of their members/employees. 17. Publishing a book is not the same as printing a book. Publishing is about marketing and sales and distribution and risk. If you don’t want to be in that business, don’t! Printing a book is trivially easy. Don’t let anyone tell you it’s not. You’ll find plenty of printers who can match the look and feel of the bestselling book of your choice for just a few dollars a copy. That’s not the hard part. 18. Bookstores, in general, are run by absolutely terrific people. Bookstores, in general, are really lousy businesses. They are often where books go to die. While some readers will discover your book in a store, it’s way more likely they will discover the book before they get to the store, and the store is just there hoping to have the right book for the right person at the time she wants it. If the match isn’t made, no sale. 19. Writing a book is a tremendous experience. It pays off intellectually. It clarifies your thinking. It builds credibility. It is a living engine of marketing and idea spreading, working every day to deliver your message with authority. You should write one. 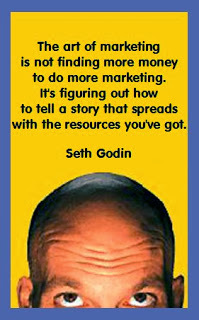 Seth Godin, the founder of The Domino Project, has written twelve books that have been translated into more than thirty languages. Every one has been a bestseller. He writes about the post-industrial revolution, the way ideas spread, marketing, leadership and, most of all, changing everything. Reprinted with permission from Seth’s blog: http://sethgodin.typepad.com/seths_blog/2006/08/advice_for_auth.html.